The ALA Office for Diversity, Literacy and Outreach Services, in partnership with the Association of Bookmobile and Outreach Services, has assembled the following key resources to assist library and information workers in the provision of quality bookmobile and outreach services. Bookmobiles and direct-delivery outreach services are, and continue to be an integral, vital part of libraries around the country. For over 100 years bookmobiles have served rural, urban, suburban and tribal areas, bringing access to information and life-long learning resources to all classes and communities. Bookmobiles are a central part of library service, and ALA is firmly committed to recognizing their contribution to public life with the goal to highlight their value and extend their reach. Visit the ODLOS Intersections blog for tips and tales from from the field. The goal of the Bookmobiles Column is to provide information, answers, successful program reviews, interviews with interesting Bookmobile staff like yourself, and any other exciting ideas or news that comes our way about Bookmobile Service. National Bookmobile Day (Wednesday, April 10, 2019) celebrates our nation’s bookmobiles and the dedicated library professionals who provide this valuable and essential service to their communities every day. This special, nationwide event is an opportunity for bookmobiles fans to make their support known—through thanking bookmobile staff, writing a letter or e-mail to their libraries, or voicing their support to community leaders. National Bookmobile Day is coordinated by the ALA Office for Diversity, Literacy and Outreach Services (ODLOS), the Association of Bookmobile and Outreach Services (ABOS), and the Association for Rural & Small Libraries (ARSL). 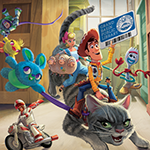 Disney and Pixar’s “Toy Story 4” characters join ALA for Library Card Sign-up Month!